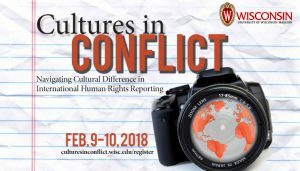 A group of award-winning journalists will visit Madison in February to attend a University of Wisconsin-Madison conference on ethics in human rights reporting co-sponsored by the School of Journalism and Mass Communication. The conference, titled “Cultures in Conflict: Navigating Cultural Difference in International Human Rights Reporting,” addresses themes of international press freedom, representation of sources, safety in the field, and cultural difference. It is scheduled for Feb. 9-10, 2018. Most of the journalists participating in the conference are current or former international correspondents. They have reported for dozens of major U.S. and international outlets, including the Guardian, Reuters, the New York Times, the Washington Post, National Public Radio, the Boston Globe, Newsday, CBS, BBC World Service, Czech Radio and USA Today. Headlining the two-day event are veteran journalists Lulu Garcia-Navarro, host of NPR’s Weekend Edition Sunday, and Sheila Coronel, co-founder of the Philippine Center for Investigative Journalism and Dean of Academic Affairs at Columbia University’s Graduate School of Journalism. They will speak on Friday, Feb. 9 and Saturday, Feb. 10, respectively. USA TODAY’s Managing Editor for World News and UW-Madison alumnus Owen Ullmann will speak on a Friday panel. Ullmann received his master’s degree in journalism from UW-Madison and went on to cover the White House, foreign affairs, economics and political campaigns. The conference schedule includes two keynote presentations and five thematic panels. In addition to the presentations, there is time incorporated for small group discussions, which Palmer hopes will stimulate local discussion about global issues. The February conference is free and open to the public, though registration is required. To learn more and register, visit culturesinconflict.wisc.edu. The conference is sponsored by the Institute for Regional and International Studies (IRIS) and the School of Journalism and Mass Communication. The event is made possible with additional support from the African Studies Program, Center for Russia, East Europe, and Central Asia (CREECA), Center For Southeast Asian Studies (CSEAS), Middle East Studies Program, Center for Journalism Ethics and the Anonymous Fund.